Hello. My name is Tracey and I have just learned to properly sear seafood. There, I said it. It’s a little embarrassing, given the time I’ve been cooking seafood, but that’s what it’s all about, right? Learning new and better ways of doing things! While watching cooking shows, I would often think, wow, that’s a beautiful sear on that fish! Why doesn’t my fish look like that when I do the same thing? Well, I finally figured it out. I simply wasn’t leaving the fish in the pan long enough to get that nice golden sear. I have since discovered that my sense of timing is very, very off. For instance, when I think I’m doing something for 2 minutes, it’s actually more like 45 seconds. I blame the digital age–it’s messing with my attention span! Or perhaps it has something to do with the way food television is edited! Whatever the reason, to solve this, I’ve started using the stop-watch feature on my phone to time myself. 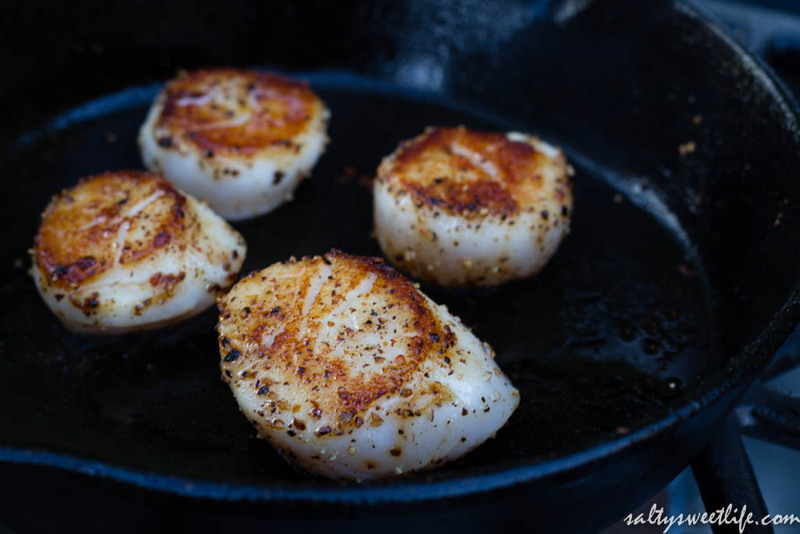 I tried this with scallops first because I never understood why I couldn’t get that deep golden brown sear on them. The recipe I was using said to sear the scallops on one side for 4 minutes. 4 minutes didn’t seem like a long time until I started the stop watch. Sure enough, within a minute, I was starting to get antsy, thinking surely it was time to turn the scallops! Turns out, in my head, 4 minutes is an interminably long time to cook a scallop! But the recipe was spot on. 4 minutes was exactly right on the money. Finally! A properly seared scallop that was not at all overcooked! Win! So, if you’re like me–an impatient cook, try the stop watch trick and see if that doesn’t change the way your recipes come out! 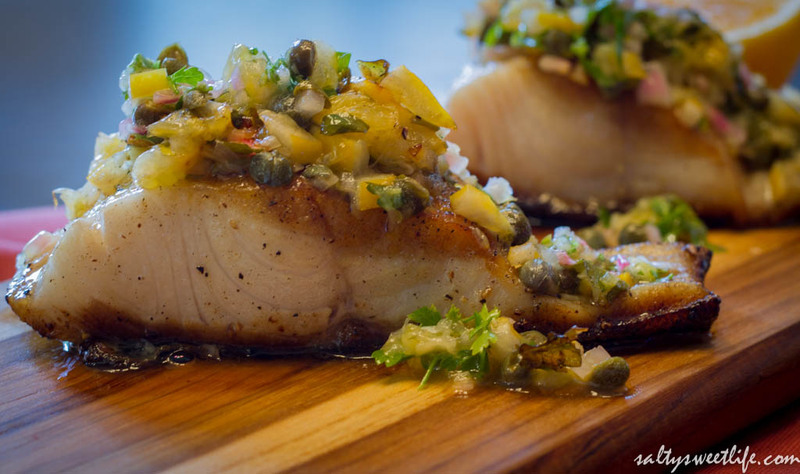 With that knowledge, let’s forge ahead with black cod! This recipe was from The Sprouted Kitchen cookbook, by Sara Forte and Hugh Forte. This cookbook is a fairly recent purchase and I’ve now made quite a few of the recipes and they are stellar! Do check out their blog–it is gorgeous. 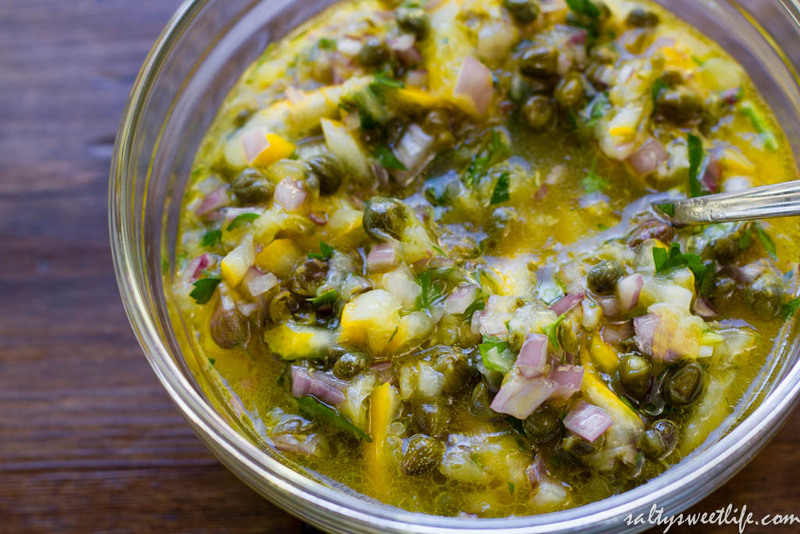 What I loved most about this dish was the Meyer Lemon and Caper Relish! It was so delicious that I was literally eating it with a spoon! The meyer lemons are “quick preserved” overnight in a little salt and vinegar and the following day, the rinds are soft and bursting with flavor! 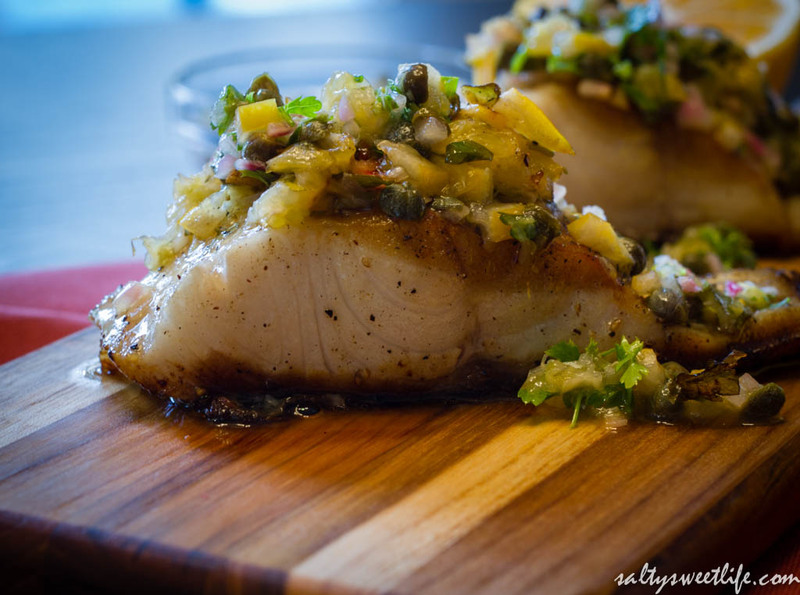 This bright relish pairs so perfectly with the rich and buttery cod. I lightly adapted the recipe by using white wine vinegar instead of champagne vinegar and I also increased the amount of agave syrup upon the Husband’s recommendation. The lemons should be prepared the night before if possible. The original recipe states that it can be made “no fewer than 4 hours” before serving, but I went the safe route and started them the night before and they were perfect. Slice the bottom and top ends from the lemon and slice the lemon in half lengthwise. Remove the seeds, then thinly slice the lemon into half-moons. Finely dice the lemon slices and add them to a bowl along with any juices that spilled out while you were cutting them. Add the salt, vinegar, agave nectar and stir. Cover the bowl with plastic wrap and leave it at room temperature overnight (or for at least 4 hours). After the lemons have rested, stir in the capers, parsley, shallots and olive oil and set aside. Using a paper towel, pat both sides of the cod dry and set it aside to come to room temperature. Season both sides of the fish with salt and freshly ground black pepper. Place the coconut oil and one tablespoon of the butter in an oven proof frying pan over medium high heat. Swirl the butter and coconut oil together as it melts. When the pan is nice and hot, place the fish skin side down in the pan, giving each piece enough room to breathe. Don’t let them touch each other! Set your timer and cook on one side for 2 minutes. Gently flip the fish onto the other side and sear for another 2 minutes. The fish should be beautiful and golden brown. Flip the fish back over so that it’s skin side down again and spoon some of the relish over each piece. The relish is wet enough that it will drip into the pan–this is a good thing! Add the second tablespoon of butter to the pan and place the pan into the oven. Cook for an additional 6 minutes (again, use that timer!) or until the middle of the fillet easily flakes with a fork. While the fish was in the oven, I basted it a few times with the pan juices. I can’t begin to express how delicious this was! 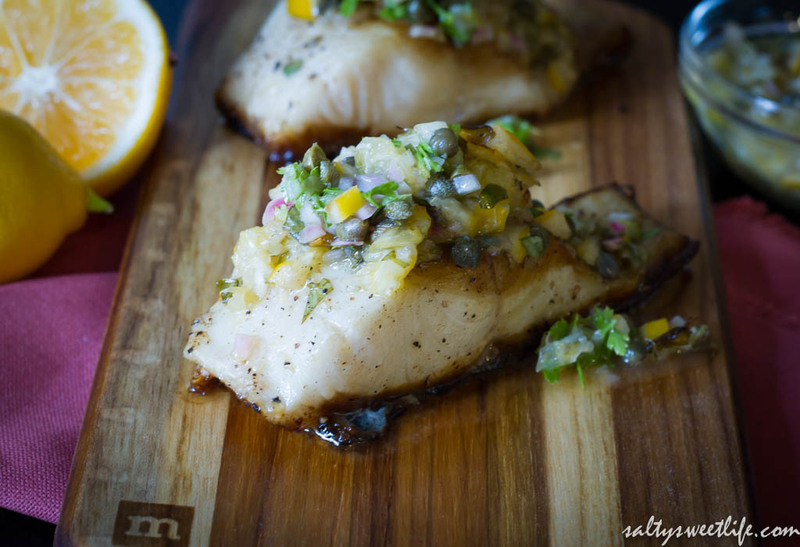 The cod is rich and buttery and retains a bit of coconut-ty fragrance from the coconut oil. The relish is both tart, salty and sweet and when it hits the pan, it caramelizes beautifully. I basted the fish several times with the pan juices and it was just amazing! I will definitely be using that relish for other varieties of fish in the future. This one’s a keeper! Wow, this looks so good Tracey! I’ll be trying this some time next week for sure! I’ll share the pics with you! Thank you Christina! Please do! I know you’re going to love it! Completely dreamy Tracey. And your pictures are gorgeous. Can’t wait to try this one. This recipe sounds dreamy Tracey. And your gorgeous photos completely draw me in. Can’t wait to try it. Thank you so much Libby! I was really afraid that the photos didn’t do this dish justice! I’m so glad you like it! Yay to searing!! It’s amazing how long time is in our mind vs. reality, isn’t it?! It’s crazy! Took me a minute to figure it out, but I’m glad I did! Thanks so much! I think that relish would be amazing on scallops, too! Thank you so much for the opportunity to join your link party!! I had some trouble getting the badge, but I think I finally figured out what I did wrong! I’m having dinner at your house! Fabulous as always. Aww! Thank you! Come on by, there’s always room at the table! Stunning! And this is the perfect time for me to see this since my Eureka lemon tree is covered in almost-ready lemons. This is going to be the first recipe that I use them in since I LOVE a dish that plays up the butteriness of cod. Oh wow! Your lemons are almost ready?? You are so lucky! My eureka lemons are growing but they won’t be ready until probably November! As for this dish, it really is all that! I was eating that relish with a spoon it was so good!